RAWALPINDI: Republic of Azerbaijan’s Minister of Defence Colonel-General Zakir Hasanov called on Chief of Army Staff (COAS) General Qamar Javed Bajwa at the General Headquarters (GHQ), said the Inter-Services Public Relations (ISPR) on Friday. During the meeting, matters of mutual interest, regional security and bilateral defence cooperation came under discussion. ISPR said that Azerbaijan’s defence minister appreciated Pakistan’s efforts for regional peace and stability. Earlier, on arrival at GHQ, the minister laid a floral wreath at Yadgar-e-Shuhada. 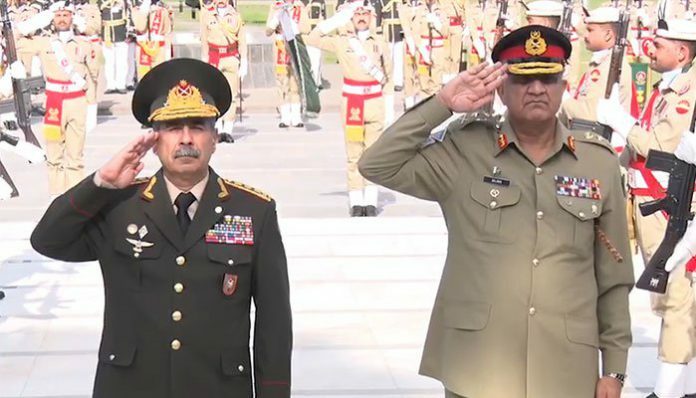 A smartly turned out contingent of Pakistan Army presented the guard of honour to the visiting dignitary, added ISPR.